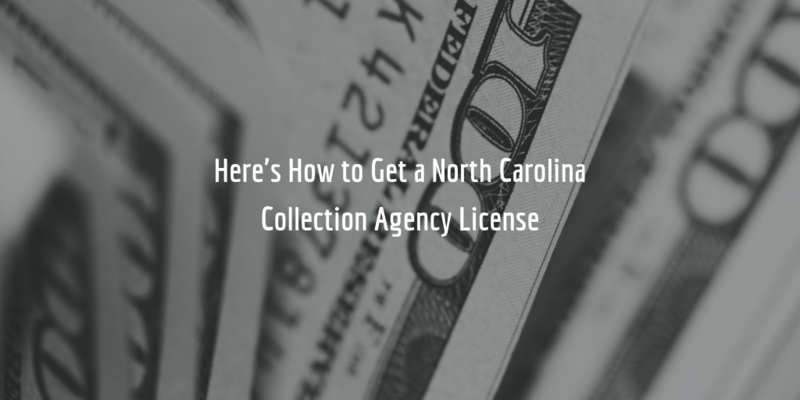 To act as a collection agency in the state of North Carolina, you will need to apply for a license from the North Carolina Department of Insurance (DOI). Conducting collection business without a license in the state is illegal, and so you need to go through the application process before you can start with collections. Upon applying, you will need to submit a number of documents to the DOI, such as financial statements and a collection agency bond. Keep reading for an overview of the North Carolina collection agency license application process! Once you submit all of the above, your application will be considered complete, and you will hear from the Department regarding its processing and approval. Be aware that branch offices of collection agencies require a separate license, and cannot use the same license as the main office/agency. North Carolina collection agency licenses expire yearly on June 30 and must be renewed prior to that date! The renewal period begins in early April, and you can expect to receive a renewal notification from the Department latest by early May. See the FAQs on the Department website if you have any outstanding questions regarding the licensing requirements. For more information about the obligations of collection agencies in the state, see Chapter 58, Article 70 of the North Carolina General Statutes (NCGS)! Collection agencies in the state must submit a surety bond to serve as financial guarantee that they will conduct business honestly, and in accordance with the provisions of Article 70 of the NCGS. If an agency violates the provisions of the Article by, for example, defrauding its clients, the latter can file a claim against the bond to request compensation. Compensation under a bond claim can be as high as the full amount of the bond. Depending on whether the applicant for a collection agency license is an in-state (“domestic”), out-of-state (“foreign”) or out-of-country (“alien”) applicant, bond amounts vary. Domestic applicants require a $10,000 bond, foreign applicants a $20,000 bond, and alien applicants a $40,000 bond. The cost of getting bonded is only a fraction of this amount, though. It is determined by the surety on the basis of an applicant’s personal credit score. Other factors may also influence the cost but typically the higher an applicant’s score, the lower their bond rate will be. So, for example, if you have a FICO score of 700 or more, you can expect to be offered a rate between .75% and 1.5% of the full amount of your bond. This means that if you are a domestic agency, and are offered a 1.5% rate on your bond, you will need to pay only $150 to get bonded. Want to know how much exactly your bond will cost? Complete our bond application and we will provide you with a free and precise quote on your bond, with no obligations attached!